Three new LG phones: Sentio, dLite and GS170 have been announced by T-Mobile. Both LG Sentio and LG dLite will be equipped with T-Mobile Social Buzz, an app to access to popular social networking sites. LG Sentio features a 3-inch touchscreen, 3MP camera, GPS, 3G, media player, email, and visual voicemail. LG dLite is a clamshell phone coming with a 2.8 inch display, 3G, hidden LED matrix on the front for alerts, media player, email client, and visual voicemail. The dLite phone by LG will be available in two colors – bubblegum and electric blue. 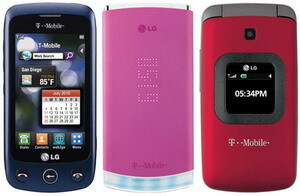 Another basic clamshell phone is LG GS170 which comes with simple user interface, VGA camera, Bluetooth, speakerphone. LG Sentio, LG dLite and LG GS170 will be available this summer. No word on pricing yet. 0 comments on "LG Sentio, LG dLite and LG GS170 for T-Mobile"